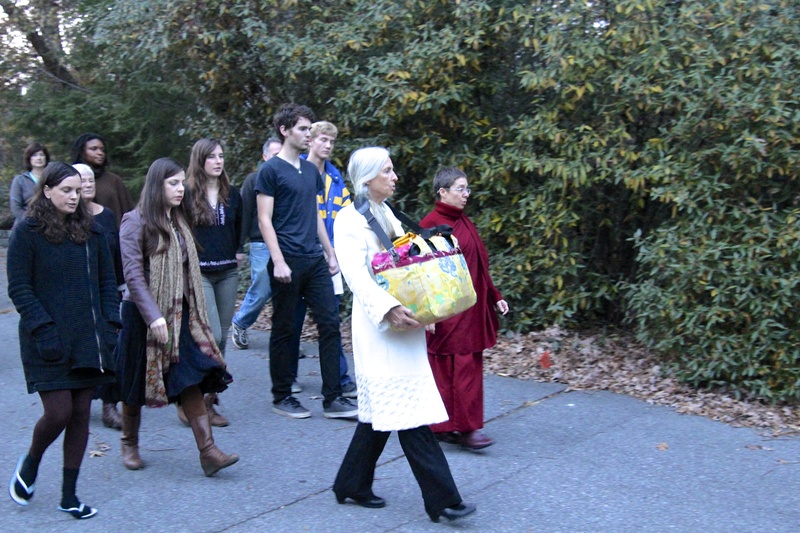 The Bu ddhist Relics have come and gone from Asheville, but the memories of the Loving Kindness Tour , http://www.maitreyarelictour.com/, will live on at the OM Sanctuary forever. To assist in the efforts of Pat McLaurin, Event Organizer, who brought the tour to Asheville, OM Sanctuary volunteered to provide lodging and some meals for the custodians and the relics during the tour. Why was this so wonderful? Pat’s words offer a perfect explanation: “ That feeling of being “bowled over” with love when experiencing the relics propelled me to contact the organization and find out what was necessary to bring the relics back to Asheville.” For a week, the Buddhist relics and custodians would retire to OM Sanctuary each night. It was like being part of an ongoing wave of love. Before the custodians departed, a small group of our community was bestowed with a very intimate and very special departing blessing at OM Sanctuary by the custodians and with the Buddhist Relics. The ceremony consisted of Prayers of Peace and Prosperity for all who were present, for OM Sanctuary itself, and for all the future visitors who would come visit our beautiful organization. The ceremony began in the Serenity Garden, followed by a procession with the relics. The custodians honored Shelli Stanback, OM Sanctuary founder, by allowing her to carry the relics. This is blessing she said will live in her heart forever. OM was fortunate to host the Buddhist Relics and their beloved Custodians and are grateful for having the divine energy permanently infused in our grounds. Their next stop was Jacksonville, FL and then on to Cork, Ireland. 11 Dec	This entry was published on December 11, 2014 at 2:44 pm and is filed under Uncategorized. Bookmark the permalink. Follow any comments here with the RSS feed for this post. Older: Rest and Renew, OM Sanctuary style!